Marketers’ top priority is converting leads to customers. Image courtesy HubSpot State of Inbound. If you work in marketing, you probably don’t need fancy reports to come to this conclusion. Even though it’s always important to feed the top of your funnel with net-new leads, pushing new leads through to opportunity and closed-won stages is probably also a priority for your team (if not the priority). So how do you push more leads down-funnel? You probably already have ideas on this one, too. Important tactics include nurture programs, segmenting and prioritizing the best leads for sales, creating buyer persona-specific content, and optimizing your sales development outreach. Not all firms respond quickly enough to leads. Image courtesy HBR. OK. So how can you follow up with leads faster? Lead list uploads - After capturing leads from any source, marketers first need to upload their leads to their system of record, such as their marketing automation platform (MAP) to set the stage for follow-up and additional campaigns. Lead enrichment - Once leads are loaded into the system, marketers need to ensure each lead is fully-formed and contains sufficient data for follow-up. (The hottest lead in the world isn’t actionable if it’s missing key information like company, title or phone number.) Ideally, this also includes a seamless transfer of lead data from your MAP to your CRM. Lead segmentation (scoring, account matching) - Ideally, marketers use some kind of filtering process (or processes) to segment leads before follow-up. This can include steps such as scoring to identify the hottest leads for sales, or lead-to-account matching to match new leads to existing accounts to ensure sales teams don’t waste their time chasing leads from accounts already in play. These processes increase sales productivity and mean a higher win rate overall. Lead routing - After your leads are properly segmented, operations professionals need to route the hottest leads to their sales teams. After matching leads to accounts, marketers can then assign the hottest leads to sales team members that own those accounts, route warm leads to sales development reps (SDR) for outbound follow-up, or send cooler leads to nurture programs. Every step in this lifecycle is important. Unfortunately, many marketing teams experience challenges at one stage or another, whether that be issues properly formatting lead lists for upload, routing leads to the wrong sales reps (or not at all), or something else entirely. Breakages at any of these stages can lead to painful delays that can make you 7x less likely to ever speak with a decision maker (and puts your sales team that much farther from turning any of those costly leads into closed-won deals). What causes breakdowns in the lead lifecycle? Siloed data - A recent survey of 400 executives found that 87% of companies feel their data is siloed among different sources - locked up in various applications or databases with no way to take action on it. This is frequently the case for marketers, whose lead and customer data locked up in their MAP isn’t necessarily synced with data in their CRM, outbound solution, or elsewhere. Not having unified, synced data leads to constant lead management headaches, including duplicate lead lists that incorrectly inflate lead counts, routing leads at the wrong stage to the wrong destination, or accidentally continuing to contact leads that have opted out. Poor integrations - One of the most common causes of data silos is a lack of robust integrations among marketers’ tech stacks. 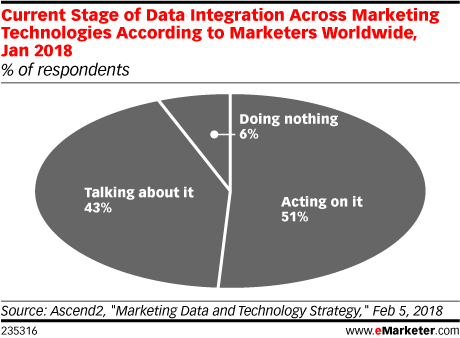 While some surveys find that 97% of marketers believe tech integrations are important for growth, others show that only about half are doing anything about it. Here’s the problem: your most important marketing applications probably aren’t seamlessly integrated to the customized use cases you need for your organization. This means your most important lead data remains locked up within each of your apps. Without robust integrations, none of your individual apps can provide important insights on the full picture of how your leads engaged with you...and the best way to follow up. Process breakdowns - Research suggests that 60% of sales professionals spend at least an hour on manual data entry daily. How much time are you spending on manual processes daily, such as vetting lead spreadsheets, or copy-pasting lead data from one source to another? Manual lead management processes cause many challenges, like introducing human error, not to mention eating up tons of time, which means your response time gets longer and makes you significantly less likely to convert. More than 60% of sales professionals spend at least an hour on manual data entry daily. Image courtesy HubSpot State of Inbound. Full API integration: GAPs can connect any cloud-based app (including MAP, CRM, outbound, webinar, database, project management, and many others) at the API integration level. APIs are the fastest, most efficient way that cloud-based software communicates with other software, and the best GAPs deeply connect applications to flow data even from highly customized instances. Sophisticated automation with flexible logical operators: GAPs automate processes among multiple cloud apps, such as setting a process to automatically update lead information and trigger appropriate campaigns in CRM, outbound email automation, and other apps whenever leads engage with your campaigns or website. The best GAPs support complex, multi-step workflows with logical operators for if/then, looping, and branching steps to do exactly what you need with your leads. Ease of use: Another important feature to look for is a completely visual, user-friendly builder. One that lets anyone - not just engineers - easily build workflows to process and upload lead lists, route enriched leads to the right owners, and execute customized follow-up - faster, without errors, and without having to code. Scalability: The best GAPs scale with your team’s data usage and needs, and are built to help you collaborate with your team, not bottleneck your progress by limiting access to individual connectors or individual users. Marketing leader Outreach uses a GAP to automate the entire list upload process to save dozens of hours in manual labor. Advertising leader AdRoll uses this technology to rapidly enrich enormous lead lists and drive 13% more sales appointments. Learn more about how you can use a General Automation Platform to close your lead management gaps by joining our weekly group demo.